The latest tractor mounted weedwiper from Blaney Agri is proving its credentials in tough applications with one Isle of Skye farmer. Jane Carley reports. Dual rollers and automatic weed sensing on Blaney Agri’s Wipeout2 offer effective weed control on testing terrain. Weedwipers have long been the go-to product for controlling weeds on environmentally sensitive and challenging land, and County Antrim manufacturer Blaney Agri’s sister company Quad-X has been offering ATV-compatible machines for several years. In addition, at Lamma 2015, Blaney Agri, which specialises in larger scale, tractor-mounted equipment, launched the Wipeout2, a dual roller version with an innovative weed detection system which only activates chemical application when weeds are present. Donald Rankin farms 40 acres (100 acres) of upland pasture on the Isle of Skye and is building up a new pedigree Angus herd, having recently switched from commercial Simmental crosses, and a 300 strong flock of sheep. He also has 20 Texel ewes. 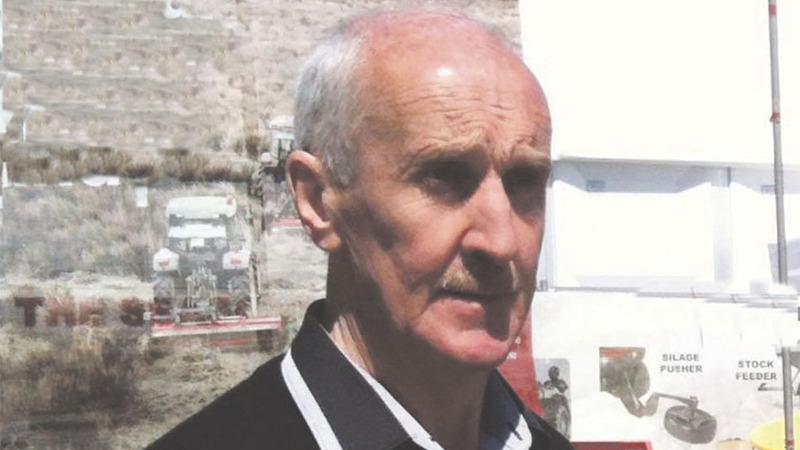 “The market demands quality, so I am looking to improve grassland for my stock,” he explains. Rushes and thistles are the main weed challenges, and as Mr Rankin established new clover in the sward two seasons ago, he was looking to tackle weeds while protecting the clover. “I saw the Wipeout2 advertised and had a look at it at the Balmoral Show before purchasing a 4.5m version in summer 2015,” he says. Donald Rankin is looking to improve sward quality on upland grazing for a new herd of pedigree Angus cattle. The design uses absorbent long fibre rollers for minimal drips and optimum chemical retention and application, while the synthetic fibre is designed to offer maximum chemical resistance without rotting. A new development, the dual rollers rotate in opposite directions for best chemical application, says the manufacturer, without the need to wipe in the other direction, to save time and chemical. The first roller lifts the weed and applies chemical to the sensitive underside, rather than the waxy surface for faster kill rates. The second contra-rotating roller acts to separate out clumps of weeds for better application. Chemical is applied to the primary roller, while the second roller absorbs any excess to minimise drips. Mr Rankin comments that the Wipeout2 has offered considerable savings on chemical compared to boom spraying using its automatic weed sensor and chemical application. This automatically activates the system to apply the right amount of chemical to the rollers, depending on weed density. Chemical is applied in the form of micro-bubbles which attach themselves to the open fibre rollers without bursting. Upon contact with the weeds, the micro bubbles burst to provide better stem coverage. “Thistles and docks sprayed this summer are all dead, and it will be interesting to see if we get any regrowth in the spring,” Mr Rankin says. The 4.5m working width linkage mounted weedwiper folds for transport and Mr Rankin comments that the wide profile tyres travel well over the wet ground. Two individual units also float to follow ground contours using a spring suspension system which allows application accuracy to be maintained even on steeper land. The machine has an infinitely adjustable height range from 140mm to 500mm, depending on the tractor linkage. 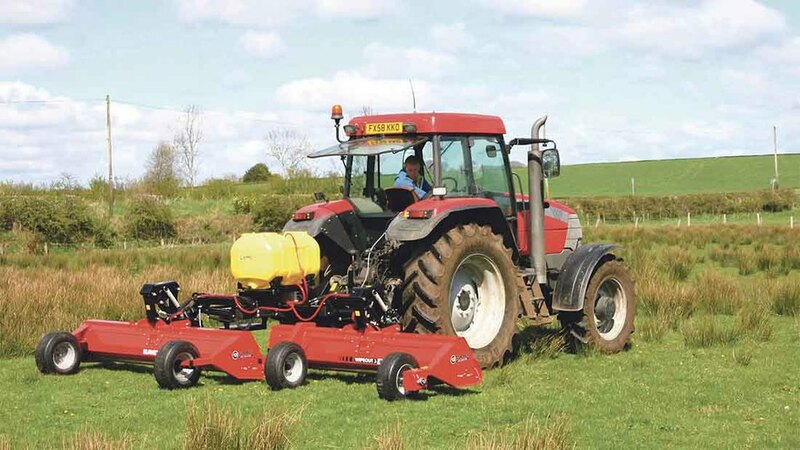 Hydraulic height adjustment is a feature on the 4.5m models and above, for repositioning to suit grass and weed height. Mr Rankin uses a 95hp Valtra to pull the Wipeout2 but says that a smaller tractor would do equally well. A durable 230 litre UV-protected spray tank holds the water/chemical mix, positioned on a raised frame to allow inspection of the tank contents without having to leave the cab. Fold away steps give access when filling the tank.